Windows has never been very good at providing a means for users to control startup programs. Too many programs starting with Window can significantly increase boot time – and because programs that start with Windows run in the background – too many programs starting with Windows can measurably affect your computer’s performance. And while Windows 10 Version 1803 (April 2018 Update) makes it easier to control startup program, it isn’t the best solution. It falls into the “better-than-nothing” category. 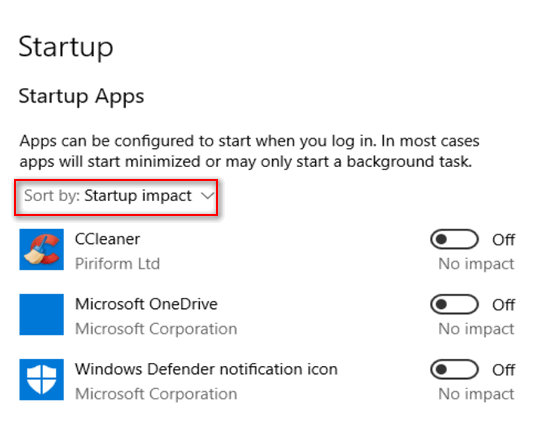 There are better programs for controlling your startups such as Microsoft Sysinternals “AutoRuns” ( although it’s not for beginners) , Reg Organizer’s startup feature and several others. But using Windows Startup feature is better than nothing and it does let you see some of programs that most impact your computer’s startup. It also allows you to easily disable startup apps/programs. Open Settings (Right-click the Start button click “Settings”). 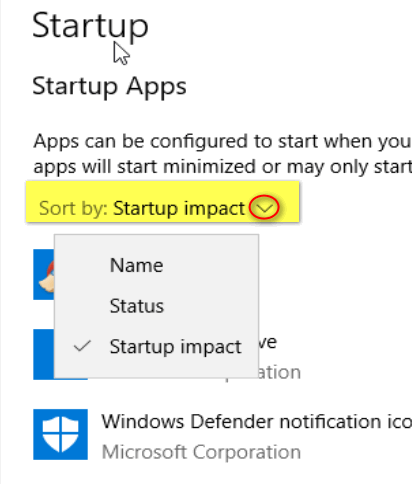 In “Apps” click on Startup in the menu in the left pane. If you look above, you’ll see I have sorted the startups by impact – meaning the programs that affect boot time and/or computer performance the most – at least according to Windows. And below you can see I have all the startups listed – turned off- meaning they won’t start with Windows and they won’t run in the background either. I can still run them whenever I want to by using clicking on their shortcuts. Note… this is a newly formatted test machine and there’s not much installed on it. Your list of startups will probably be much longer. The problem Windows startup control is that it is not comprehensive and usually isn’t a complete listing of all programs starting with Windows. But it is better than nothing… and it’s at least worth a look. Hi Gina, I answered you personally on this and we’ll feature it in our weekly newsletter. If someone made a list they would be presuming to know what you needed and what you didn’t need – and no one can know that. Everyone uses different programs and use them in different ways. No one can presume to tell anyone what to allow to start up or to disable. Generally, if you’re not sure, you shouldn’t use any advanced startup managers (like AutoRuns). If you stick with Windows Startup manager you’ll be better off. It’s not comprehensive but it is a lot safer if you’re not sure what you’re doing. General Rule: Don’t disable anything with Microsoft in its name and don’t disable your security (antivirus/anti-malware). I use AutoRuns, and yes it is not for the average user.I love it if you decide to use use with caution.